I couldn't see a thread about this using google search so hopefully this is okay! Do any of you have experience with puppies who were born premature, and any potential issues long term? We got our lovely boy at 10 weeks old, he was born in a litter of 3 and was 3 days premature (first litter for the mum). In dog days this is apparently quite significant. Our breeder had to tube feed the litter as they were too young, and the mum had a bit of trouble feeding the puppies initially, but eventually figured it out and they all survived and seem to have developed fine. 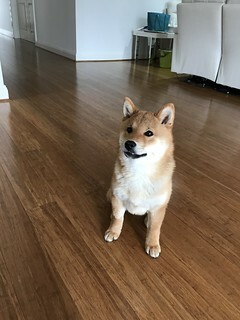 He is nearly 7 months old now and is the most amazing puppy ever, partly thanks to this forum which I've been lurking and gaining insight and advice from. He has been health checked by the vet several times and has no problems with heart, knees, hips etc. We've had very little issues training him - he is incredibly smart and a fast learner. 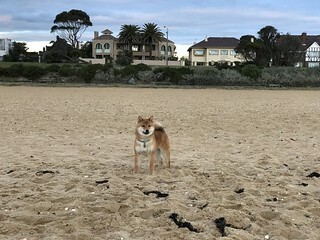 He is toilet trained, crate trained, doesn't bite or get mouthy even when he was teething, doesn't chew furniture, doesn't steal laundry or try to eat things he's not supposed to eat, gets along with other dogs extremely well, is great off leash and rarely barks. 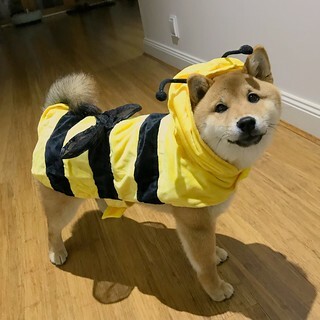 Literally an anti-shiba according to everything I've read... He is just great though and we love him so much. 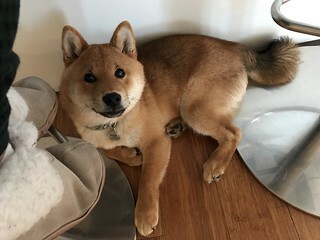 The only thing that it seems to have affected is his size - he is about 7 kg (15 pounds) at 6.5 months, whereas his "brother" from another litter born at term around the same time is a full kilo heavier. We have gotten extremely lucky with him and we owe that to our breeder who raised him so well and socialised him from a young age. However, lately I have been thinking about whether there are any potential long term consequences of him being premature? I googled it when I was first looking at getting a pup, and also spoke to a friend who is a vet, and it seems that the main risk is that the puppies do not survive the first week or so, but they grow up fine. Does anyone know if there is anything else I should keep an eye out for, or check on as he grows up? My older sister was premature, and she is fine. The reason I say this is because, for the most part (especially in this kind of situation) there is no real difference, physiologically speaking, between humans and dogs. He made it past his first week, and that is the thing that matters the most. It really isn't a matter of when he was born, but if he had any developmental issues already (underdeveloped lungs, etc). Those are the things to worry about :) He even looks very healthy in your pictures. I would say if your vet doesn't seem worried, then don't worry about it. I don't have any experience with premature pups, but I would think (like Anjyil said) that the concerns would be mostly with the very beginning development. Sounds like he didn't have any major developmental issues and like he's done great! I also wouldn't worry about the weight. My pup didn't hit 20 lbs until he was like over 1 year old haha. He's right at standard and I'm sure he was around the same weight as your pup at 6 months. He took a little time to fill out, and I was told by his breeder that his mom usually produces males on the small side of standard, so I was never concerned haha. Anyway your pup looks adorable and healthy to me! Of course it's always good to have health evaluated regularly, which it sounds like you're doing. He was nippy around 4 months of age and we had to use "time outs" a few times when he got too mouthy/bit too hard, but since then he's been quite good. Although he goes through toys extremely quickly! He doesn't like the rubber Kong ones or similar, prefers stuffed bears, but can destroy them in a few minutes if left unattended and in a particularly ferocious mood. Even rope toys he manages to unravel in a couple of hours. So we have to buy new toy fairly often, but at least the furniture is safe lol! XD Coal unties and devours rope toys, so we doesn't get them anymore. Kong and the Kong tires are the only toys he gets most of the time, everything else is supervised. Have you tried stuffing the kongs a few times? He may have a strong hunt/prey drive like Coal does. After Coal's adult teeth set in, we decided to get him an antler to chew on. He loves it to death and it really helps wear him out. So when he is older, I recommend something like that. He would happily eat the kibble from my hand so I used to hand feed him everyday (my partner said I was spoiling him), possibly one of the reasons why he isn't very mouthy as he's used to eating gently from my fingers. I also hand feed him chicken necks and raw food so he has to eat it very gently without crunching my fingers. Nowadays he's a total pig so we use the Kong wobbler and he enjoys that quite a bit. He also loves his raw meaty bones but tends to put his paws all over it (he eats it on the grass in the backyard) then walks inside and all over the carpet lol and I can't be bothered wiping his feet every time. I am always nervous about him cracking a tooth too because he literally eats the whole bone. Deer antlers are REALLY expensive in Australia (like $15 for one...) so I haven't tried them yet, but am willing to if he likes them! Are they messy? Would they be suitable for chewing indoors or is it an outdoors only chewable? Kongs should start out easy---just put some of his favorite treats or kibble in there without mashing/freezing it, then work your way up in difficulty (half soft/half dry, fully soft, then freezing). edit: not so durable...but still kind of okay XD He managed to chew the end off. Oh well. Lol! I love the edit... :P I'll have to try a deer antler then and see how he goes with it and report back. Actually I just thought of a funny thing he likes chewing... ROCKS!! He is constantly digging up rocks and even chunks of cement from our garden and chewing on them/playing with them! I'm worried for his teeth but can't stop him lol. He's got HEAPS of toys to chew, sticks etc. but he loves his rocks! Such a little weirdo. Be careful that he isn't swallowing the rocks. My brother's lab had a blockage that required surgery. She wasn't just chewing, she was eating the rocks! Hmm... Coal used to eat rocks, but stopped around four or five months. Be careful with that.